The weather has been wild here, there is a crazy blizzard around the country with many of the roads closed. The red lines show the roads are impassable and the little yellow flags mean blizzard! I have had guests for Gamla Posthusid that have had to cancel or are delayed as they can no longer get through, we have had blizzards before but this one seems to be lasting longer than the others...since I have been here anyway. The popular Airwaves festival has been on this week so plenty of tourists are experiencing the real Iceland. Apparently skyscrapers in the city channel severe gusts of wind and this video from RÚV shows how difficult it is for people to walk within this area of Reykjavik. 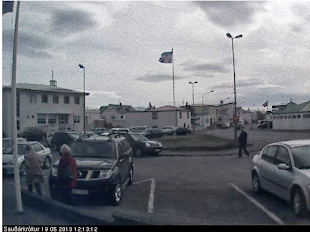 On the home front this little video shows what the day was like in Sauðárkrókur on Friday, pretty much business as usual, people still went to work, children went to school, the shops were all open, little deters Icelanders, I however chickened out and cancelled a meeting I had that day...definitely an indoors day for me. As I am posting this it seems to be easing up a bit...so I am off out to the bakery! Wow that is amazingly difficult weather to negotiate - Icelanders must be a tough lot.